The original letter of Yoshitsune is in this temple. The tragedy of Yoshitsune started at here. In 1185, after the great victory of Ichiya, Yashima and Dannoura, Minamoto no Yoshitsune defeated Taira clan, and he tried to went back to Kamakura. However, because Yoshitsune made all decision by himself duirng the war, Yoritomo distrusted him and didn't allow him to entire Kamakura. Yoshitsune had to stay here in Koshigoe, and wrote the letter of reaffirmation of his allegiance to Yoritomo and a pled to be restored to favor. The letter was wrote to Ooe Hiromoto. However, the letter didn't have the letterhead, therefore it stayed in this temple. Koshigoe jo, the reaffirmation of his allegiance to Yoritomo. I was chosen by Kamakura-sir (Yoritomo) as the alternate general of the Emperor and defeated Taira clan for the revenge of our father Yoshitomo. I thought he is going to give me a great reward. However, instead of giving me a reward, he rebuked me and ordered to stay out of Kamakura because he was listening to other one's clam of me. I am so sorry that I had to stay here in Koshigoe. I was wishing to see my brother's face with lots of mercy, but it never happened and it's been long time since I saw him last time. Now I feel like we are not brothers anymore. Why I have to be treated such a raw deal with my own brother. I was only hoping to defeat Heike clan and let our father rest in peace. I had no other ambition. I believe Kamakura-sir should feel happy because I received the highest rank of general from the imperial court. I have no idea why he is so upset. I sent the letter of apology and told him that for the sake of gods, I have nothing do wrong, but he never forgave me. Dear Ooe-sir please tell Yoritomo-sir my feeling, if you could make him forgive me, I will never forget your great favor. 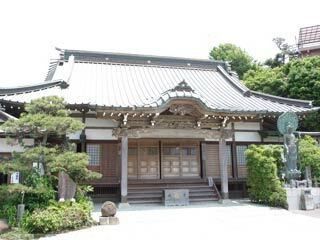 There are many Yoshitsune and Benkei related spots in this temple. ... Benkei used this water when he was writing Yoshitsune's letter. ... Benkei carried this stone for comforting Yoshitsune.